Special re-post for Paryushan: Are eggs vegetarian? Sagar Kirit Shah, an economist from London, reflects on his experiences with eating eggs and argues why vegetarians who do not wish to kill animals should not eat eggs. The question of whether eggs are suitable for vegetarians is one which most vegetarians living in the UK will have encountered at one point in their lives. And from the perspective of a young person of an Indian cultural heritage, it is a very confusing one. In India, the norm is that eggs are not vegetarian – if you see the words “pure veg” on an Indian product or at an Indian restaurant, you can generally be sure that there will be no eggs. But in the UK, the official definition of a vegetarian, as set out by theVegetarian Society, permits the consumption of eggs. As a result, products containing eggs are normally labelled as vegetarian in supermarkets and restaurants in the UK, to the dismay of many Indian vegetarians. Even though I’ve been a proud “vegetarian” for as long as I can remember, I’ve been confused about what I think about eggs for most of my life, and have switched between shamelessly enjoying them and trying to avoid them. I think many young people from the Jain community in the West have faced a similar internal conflict. Having carefully considered the issue, I now believe that those of us who are vegetarian because we think it is wrong to kill animals for food should not eat eggs, regardless of whether the eggs are free range and/or organic. In this article, I share my experiences of eating eggs and explain why I adopt the position that I do. 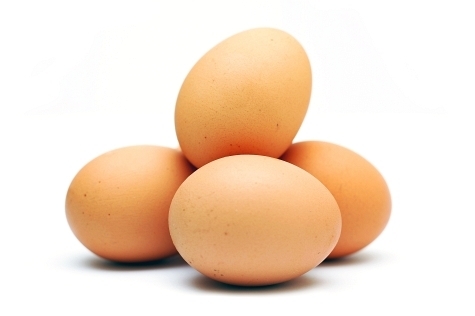 As a young child, I loved the taste of eggs, and would eat them several times a week. My dad constantly reminds me of how my favourite meal as a child was scrambled eggs and toast. Then, at the age of eight, I read a Jain textbook by Vinod Kapashi and Ajit Shah which said Jains shouldn’t eat eggs. I immediately decided to stop eating eggs. My mum and ba were very supportive about the decision and decided to stop bringing eggs into the house. A couple of years later at secondary school, I started to feel unhappy that I was missing out on birthday cakes and had a fairly restricted choice of foods when out and about (most sandwiches, for example, contained mayonnaise so I couldn’t eat them). My desire for cakes and brownies got the better of me, and I slowly started to eat eggs when I couldn’t see them – when they were hidden away in food. This proved to be a slippery slope. As I got older, I gradually started to eat dishes containing eggs more often, and occasionally started eating dishes that were predominantly egg based (quiches, omelets). Then, when traveling in South America in a year out between school and university, I started to eat eggs almost every day, initially because they were a filling and easy-to-order option when “pure vegetarian” options were hard to find. Soon I started to order them because I liked the taste, and would choose to eat them even when “pure vegetarian” dishes were readily available. Initially, I felt uncomfortable eating them, but this soon wore off. I tried to forget about the guilt when eating eggs, just like I did when purchasing/wearing leather. And because I liked the taste of eggs and enjoyed eating them so much, I also tried to justify eating eggs from a moral perspective. Eggs were generally unfertilised, so by eating them I would not be preventing a living being from being born. And even though there was “jiv” in the egg of some form or the other, I argued to myself that the pain/suffering inflicted on eggs would be low, primarily because its nervous system would not be developed. On our travels in South America, my vegetarian friends and I were occasionally offered the option of eating eggs from animals other than chicken – fish eggs, ostrich eggs, quail eggs, duck eggs and so on. Whenever this happened, our immediate reaction was one of acute discomfort. We asked ourselves whether fish eggs could ever be suitable for vegetarians. I started thinking about how a mother ostrich would feel if a human came along and stole its eggs. I soon realised that my position with eggs was inconsistent. I was somehow able to morally justify eating eggs from chickens, but I couldn’t bring myself to eat the eggs of other animals, and would even get upset by the idea of humans stealing them. Prior to this moment, I would often highlight the hyprocrisy of “animal lovers” who would get angry whenever they hear about cruelty to dogs or the killing of wildlife in Africa, but happily eat the flesh of an abused chicken, pig or cow. I soon realised that I wasn’t too different from them. After visiting some farms, I also realised that many traditional breeds of chicken are actually very protective over their eggs. I had previously known that geese would try and attack humans who attempted to go near their eggs, but didn’t realise that chickens did the same. On a volunteering visit to Freightliners City Farm in London, I got a bit too close to a silkie chicken that was covering some eggs when trying to refill its water supply. 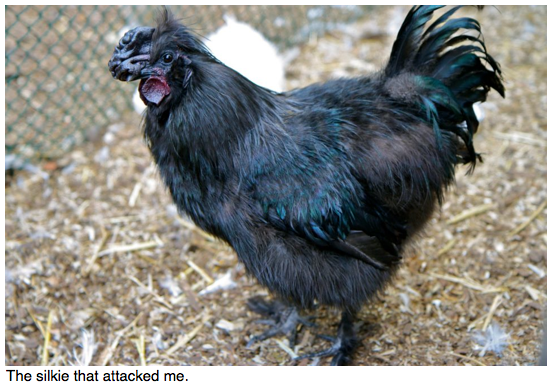 Two of the other chickens in the enclosure kicked and slapped me with their wings in order to protect their broody companion and the eggs it was keeping warm. I was even more amazed when I found out that the eggs the silkie hen was keeping warm weren’t even her own or those of a fellow silkie. The hen was looking after the eggs of a brahma (another breed of chicken) in another enclosure that had fallen ill.
After a little investigation, I found out that we humans had selectively bred chickens to produce a lot of eggs and not attack us when we take their eggs from them. But just because a bird doesn’t attack us or show anger when we take their eggs from them, it doesn’t make the act of stealing the eggs any less bad. At university I also began to find out more about how animals were treated on farms. Particularly how chickens are often kept in battery cages no bigger than the size of an A4 piece of paper, and how cows are forcibly milked by machine and not given access to outside pasture. I felt deeply uncomfortable about this, and started to eat/drink organic, and persuaded others to do the same, thinking it would reduce suffering. Then, in the summer of 2007, I did an internship in New York and attended the JAINA convention in Edison New Jersey, an inspirational convention which brought together thousands of Jains from across North America. At the convention, I discovered that a significant number of Jains in North America followed a vegan diet. In addition to not consuming animal flesh, the vegan Jains did not consume any reproductive animal products such as milk, eggs and other dairy products. Impressed by their commitment and perplexed by their decision not to consume animal products at all (I had thought free range/organic milk was acceptable), I immediately questioned the vegans about the dietary path they had chosen. After interacting with them, I discovered that welfare standards and “stealing” were not the only problems with commercial egg and milk production. I discovered that cows and chickens were actually routinely killed in the production of milk and eggs. Initially, I was horrified and argued that they were wrong. But now I realise not only what they said was true, but that it also makes perfect economic sense. The truth is that, if these cows and chickens weren’t killed, milk and eggs would be far more expensive than they currently are. Even though it is defensible to argue that the taking and eating an unfertilised egg does not result in the direct killing of a living being, one cannot deny the commercial production process of eggs results in innocent chickens and chicks being killed long before they would naturally leave their bodies. In the UK there are over 29 million egg laying hens, and over the course a year, apart from a lucky few who get saved from slaughter and adopted by a sanctuary or a nice family, each and everyone of these birds will be killed and replaced in order to supply the British population with cheap eggs. Over the course of my life, I have probably eaten a couple of hundred eggs. As a result, I believe that I am personally responsibility for the death of about 10 innocent chickens and chicks. Even though I think I have always been good natured and well-intentioned, the death and suffering I have caused is something I have to deal with for the rest of my life. Most vegetarians I know are vegetarians because they believe it is wrong to kill animals for food when it is perfectly possible to live a healthy life without doing so. And if this is the reason for being vegetarian, given that chickens are killed in egg production process, I find it very difficult to see how eggs can be considered to be suitable for vegetarians, or any adherent of the timeless Jain principle of ahimsa. *The story for milk and cows is different, but very similar. Just like humans and all other mammals, in order for a cow to give milk, it needs to be pregnant. This pregnancy naturally leads to birth of a calf. While female calves can grow up to become milk giving animals like their mothers, the males are of very little use to a dairy farmer. They consume a lot of food, but are the wrong type of cow to be reared for beef. So they are typically killed soon after birth. And while the female calves are spared immediate slaughter, they too get killed prematurely. A female cow could naturally live for more than 20 years if given the chance. But after producing milk for a couple of years, the yield of a lactating cow drops – and it makes economic sense for a dairy farmer to replace her with one of her more productive offspring. A fully grown cow that does not produce milk is very costly for a farmer to keep, and so the farmer sends the cow to the slaughterhouse.